The Opéra de Montréal’s 2017-2018 season came to a close with a full house for a performance of Roméo et Juliette in Salle Wilfrid-Pelletier. 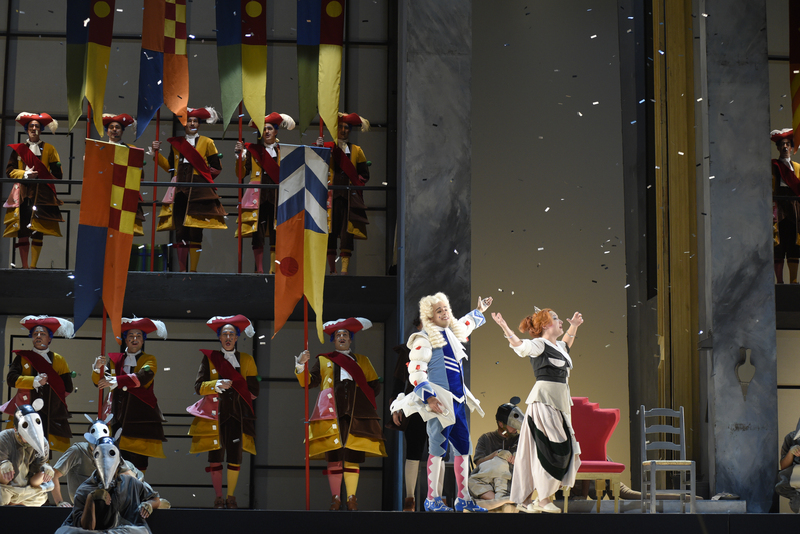 Ranging from classics like Roméo et Juliette and Tosca to a madcap production of La Cenerentola and the Canadian premiere of JFK, the four main stage works presented at Place des Arts brought in over 40,000 spectators. Alongside these major shows, we also demonstrated our commitment to reaching out to Montrealers all across our city by taking part in Montreal’s vibrant cultural scene. In this respect, the entirely female production of Svadba, by Montreal-based composer Ana Sokolović, gave us the opportunity to form a fruitful partnership with Espace GO. The critically acclaimed event, with a sold-out run, allowed audiences to discover—or confirm—the exceptional talent of six singers trained at the Atelier lyrique de l’Opéra de Montréal, our in-residence training program. In fact, Atelier lyrique members had a number of opportunities to tread the boards this season, from Julie Boulianne (alumna, 2006) in the title role of La Cenerentola to the nine current and former program members appearing in Roméo et Juliette, working alongside the international stars completing the casts. Convinced of our vision for the development of Canada’s finest opera artists, Ms. Vanda Treiser made a major $1,000,000 donation, dedicated to supporting young artists at the OdM. Another philanthropic first this year was our first Talent gala, which gave several donors a chance to hear the finalists in the Atelier lyrique’s National Auditions on stage at Salle Wilfrid-Pelletier. Building on the event’s success, we will be repeating the experience in the new season with an evening honouring Ms. Jacqueline Desmarais. We also continued to build a community of opera enthusiasts through such efforts as the free Let’s Talk Opera series of concert-talks. The initiative was so popular that we will be presenting close to fifty of these talks next year, in several Montreal boroughs and on the outskirts of the city. Deeply convinced that art improves the quality of life of those who are in contact with it, we have also increased our initiatives to reach out to marginalized populations and those left behind. New projects for visually impaired, hearing impaired, and autistic youths, in addition to the new educational project Hansel, Gretel… et les autres!—which has already been presented in tens of schools throughout Quebec—, allowed us to reach 14,994 younger and older people through our outreach activities. Within this context, it is with much enthusiasm and energy that we are looking forward to our 2018-2019 season, whose defining characteristic will be novelty, driven by several new initiatives! In this respect, one need only think of the first opera staging by filmmaker Charles Binamé—bringing Carmen back to the company after a 14-year absence—, as well as partnerships with the Festival international de Jazz de Montréal and the Arab World Festival, for the presentation of unique and memorable evenings of opera. All of these events are truly accessible, given that we have revised pricing for Salle Wilfrid-Pelletier: 800 more affordable seats per evening are now available, in addition to all-season subscriptions for as little as $99! We are privileged to present opera in one of the world’s most energetic, dynamic, and creative cities. We have made it our mission to continue to act as a catalyst for the creativity of our local artists and craftspeople, bringing them together with great international artists to give Montrealers unforgettable evenings at the Opéra! In the arts milieu—and most certainly for the Opéra de Montréal—Jacqueline Desmarais was an inspiration, an example of commitment and of vision. Once again this year, educational and outreach projects played a key role at the Opéra de Montréal. Our activities attracted audiences of all ages and all backgrounds, as well as a large number of students from every level. Exeko,in collaboration with the Groupe des onze—made up of eleven of Montreal’s largest cultural institutions, including the Opéra de Montréal—has created the Inclusive Culture Lab, a three-year project under the patronage of the Canadian Commission for UNESCO. Mr. Patrick Corrigan appointed as General Director of the Opéra de Montréal. Build your very own shows of operas from among this season's groups of operas! The Opéra de Montréal’s Young Associates invite you to join the Friends of the Costume Workshop Club by contributing to its crowdfunding campaign, which will provide support for the creation, tailoring, and production of costumes for the 2016/17 season. Opéra de Montréal: 2006-2016 – Time to take stock. As part of the OPERA America conference, the Opéra de Montréal is presenting its white paper on the past 10 years. The board of directors will soon be issuing a call for applications in order to find a new General Director. Some pre-sale tickets are now available, from March 3 to 20, 2016. Act fast! Michel Beaulac, Opéra de Montréal Artistic Director, presents you his new saison. Explore our 2016/17 season brochure!